Lots of mini workouts - Work ... Uncaged. Finding time to work out can be tricky. It would be easy to assume that working from home it would be easier. Clearly, since there is all that extra time that doesn’t get flushed down the commute drain all the other things we’re trying to get in on any given day just happen. Right. Alas, time, being the only truly finite resource for us all, is always at a premium. Over the years I’ve had various workout schedules when working from home. I’m fortunate in that many years ago, my wife bought a very nice home gym for me. I used it religiously for years. Three times a week I would work out for an hour over lunch. On the off days I would go for a swim or a run. Over that last year of so, I lost some of my motivation to keep going. Numerous studies such as the one reported on CNN that sitting will kill you and the Mayo clinic’s article on What are the risks of sitting too much? suggest that it’s a good idea to spend more time out of the chair. Since then I’ve adopted a different workout strategy. These days, I work out all day long. Well, technically, I workout throughout the day. So what does that look like? 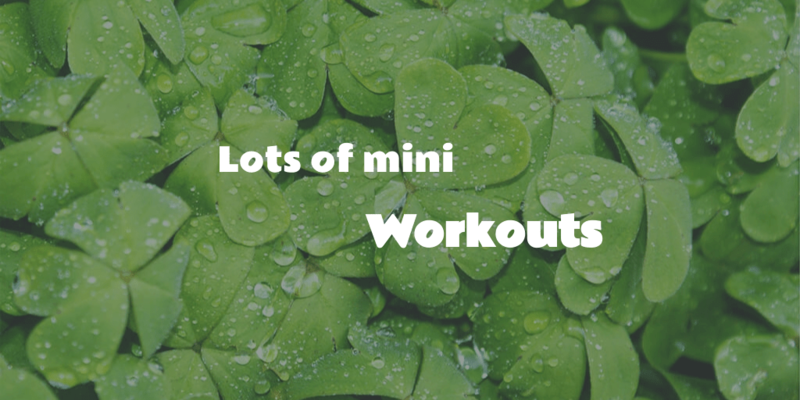 Lots of mini workouts. I often use the Pomodoro technique technique to chunk out solid focus time. When I’m done with one of my 25 minute blocks I get up and take 2 to 15 minutes to get some exercise. I’m sure training experts might frown on this, but for me, it’s been a great change to my exercise routine. At the end of the day I often end up with more than an hour of exercise. I also get the benefit of getting up routinely throughout the day, instead of sitting all day at my laptop. That in turn helps me keep the blood moving, which helps me keep my energy up. So what kind of of exercises do I squeeze in? I have a decent grab bag to pick from depending on how much time I want to take for that time between Pomodoros. The sky’s the limit on this. Often it depends on my mood, but it’s another thing that is a whole lot easier to do when you’re not in an office. I still work in a couple of long blocks for a run. Many of my exercises, though, happen throughout my day. In the end, if I take an 8 hour workday, it’s about 12-16 Pomodoro’s so on the low end, I’ll have roughly 12 * 5 minutes of exercise, which ends up being an hour. The small chunks of time also make it a lot easier for me to get it done. After all, a 5 minute chunk of time just goes by so fast and I don’t even have time to talk myself out of it. I’ve also been standing a lot while working and mixing in some unconventional sitting, but I’ll save that for another post. I sure do love working from home.